This is one of the first images taken by the DC-8 aircraft which observed the re-entry of Jules Verne ATV over the Pacific Ocean. The recent trials of an out-of-control communications satellite and a defunct, leaky Soviet-era spacecraft toting its own nuclear reactor call up the question: What exactly happens when satellites die in space? There are actually a few possibilities, some good, and others not so much. If mission controllers spot a glitch in time, they can force a still-functioning satellite to fire its engines and reach a so-called "graveyard orbit" a few hundred miles above its initial flight path in order to safeguard its neighboring spacecraft against possible damage. That's what engineers are trying to do for the telecommunications satellite Astra 5A, which inexplicably failed on Jan. 15 after 12 years of operation. The satellite has since been adrift in space, moving out of its geostationary position about 22,300 miles (35,888 km) above Earth and is moving eastward along its orbital arc. Astra 5A's owners, SES of Luxemburg, are pessimistic they'll be able regain communications with the satellite and order it out to a safe orbit, and have since warned the owners of other nearby satellites that they may need to take measures to avoid an in-space collision. Satellites at the end of their lifetime have periodically been sent into graveyard orbits. In 2006, Russia's Express-AM11 communications satellite was moved to an orbital grave after being hit by space debris. In some extreme cases, ailing satellites can be blasted out space entirely. Last year, the U.S. military launched a missile from the Pacific Ocean that obliterated the spy satellite USA 193. The missile destroyed the satellite, which was plunging to Earth with a full tank of toxic hydrazine fuel, on Feb. 20, 2008. Other satellite shootdowns have not been so tidy. When China blasted an aging weather satellite to bits in a 2007 anti-satellite test, the explosion generated a cloud of orbital debris and sparked widespread criticism from other nations. Analysts can also leave a problematic satellite to its own devices. That appears to be the case with the Soviet-era satellite Cosmos 1818. Launched by the former Soviet Union in 1987, Cosmos 1818 was the first of two satellites to test the use of advanced nuclear power plants in space. But this month, NASA's Orbital Debris Program Office issued a quarterly update reporting that Cosmos 1818 spewed a cloud of debris on July 4, 2008 that may have been the result of leaking reactor coolant from a debris strike or fragmentation. According to a Thursday report by the Associated Press, Russia's Space Forces chief Gen. Alexander Yakushin confirmed the fragmentation of Cosmos 1818, but stressed it does not pose any risk of damaging the International Space Station or raining radiation-contaminated debris on Earth because of its intentionally high orbit. The satellite is breaking up in an orbit 500 miles (800-km) above Earth - well above the 220-mile (354-km) plane of the space station - and its status is being monitored daily, the Associated Press reported. While Cosmos 1818 appears to be under control, the same can't be said for Cosmos 954, a Radar Ocean Reconnaissance Satellite (RORSAT) that spiraled out of control in 1978. The satellite re-entered the Earth's atmosphere and spread radioactive debris across parts of Canada. Ailing satellites used to have a lifeline in NASA's space shuttles, which have payload bays large enough to fit small spacecraft inside to be returned to Earth or fixed in space. The 18-year-old Hubble Space Telescope, for example, is one of the crowning achievements of satellite resurrections. NASA astronauts have visited the space-based observatory no less than four times, first to correct its blurry vision, then to add new cameras and instruments that extended its mission. NASA plans to launch the fifth and final servicing mission to Hubble on May 12. With NASA's space shuttle fleet slated to retire in 2010, sick satellites may soon be visited by robotic surgeons. In 2007, the Pentagon successfully tested flew a pair of spacecraft that demonstrated the ability to refuel and service satellites robotically. The $300 million Orbital Express mission used a target satellite and a robotic-arm wielding service vehicle to demonstrate autonomous rendezvous and servicing tasks. One of the more common ends for defunct spacecraft and garbage is death by cremation, in which old spacecraft and debris are intentionally burned up in the Earth's atmosphere. 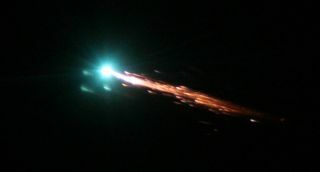 Russia's unmanned Progress cargo ships routinely end their spacefaring lives as fireballs after delivering cargo shipments to the International Space Station. The Russian Space Station Mir was also discarded in a similar funeral pyre in 2001. Jules Verne, Europe's first-ever Automated Transfer Vehicle, gave scientists a spectacular light show when it ended its debut flight last fall in a fiery blaze over the Pacific Ocean. Two chase planes were dispatched to record the death of the spacecraft, which was as large as a London double-decker bus. Some pieces of debris don't burn up in controlled cremations. Last November, a tank of toxic ammonia the size of a refrigerator burned up over the Southern Pacific Ocean more than a year after a spacesuit-clad astronaut chucked it from the International Space Station. NASA did not know where the tank would ultimately re-enter and the U.S. Space Surveillance Network tracked the object to make sure its toxic remains did not endanger people on Earth. Perhaps the most memorable piece of U.S. space junk was the 77-ton Skylab space station, which re-entered the Earth's atmosphere in July 1979, spreading debris across areas of the Southeastern Indian Ocean and parts of Western Australia.